‘Young Asian Manager’, held on Saturday 2 Mar 2019 was an activity containing tasks which had a unique blend of all streams of management. This was a jointly organized activity by all the specialization clubs of ABS, viz. Marketing Club, HR Club, IT Club and the Finance Club. 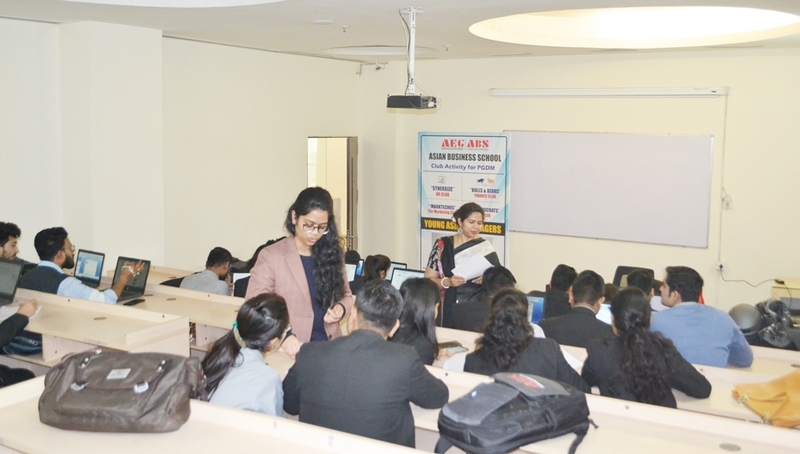 The students were given tasks aimed to cater to all the aspects of their PGDM specialization for a holistic understanding and application of concepts they have discussed in their classes so far. The activity was divided into three rounds. The first round was a business expansion case in which the students were required to prepare marketing, HR, Financial and strategic plan for the business. This round expanded their horizons on solving case studies in a short span of time. The second round was focused towards students discussing on various topics of general and managerial nature in front of the entire group, getting cross-questioned from the audience and answering queries accordingly. This round was aimed at developing confidence and public speaking among students. The third round was a business quiz in which the top teams of the first two rounds participated. This round tested their knowledge of the business world in and outside of India. The activity, spanning the entire day, gave the students a real-time experience of management situations and a glimpse of solving issues that crop up in management on an occasional basis.